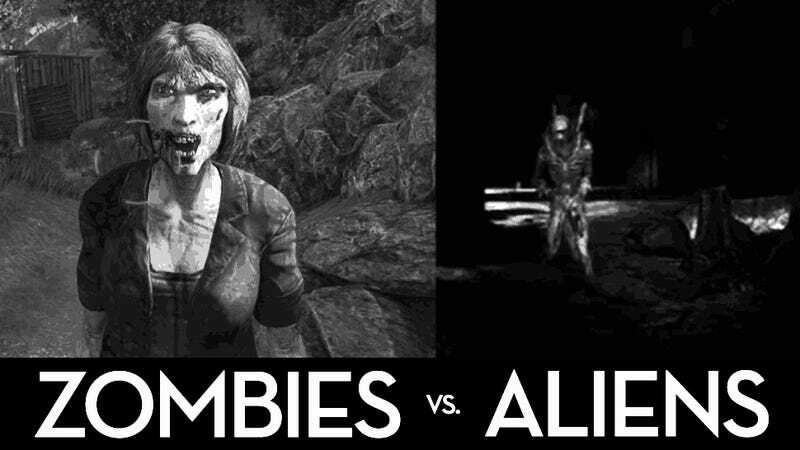 Which Is Worse, Aliens: Colonial Marines Or The Walking Dead: Survival Instinct? It's hard to say which game is the best of 2013 so far. But two games are in a dead heat for worst: Aliens: Colonial Marines and The Walking Dead: Survival Instinct. Kirk was blunt about his thoughts on The Walking Dead: Survival Instinct: he thought it was the worst game he'd played all year. But how awful are we talking here? Worse than, say, Aliens: Colonial Marines, which I hated so much it caused me physical pain to play? Time to compare the two games and find out. It fails at being an 'authentic' Aliens experience by downplaying tension and atmosphere. It doesn't touch on any of the deep themes in the films. Women, typically the heroes of the films, are also barely present. It's also not a very good shooter, often forcing you to mindlessly mow down a ton of idiotic enemies. It feels like an insulting game, in that the expectation is that Aliens fans will simply gobble the game up because it features some characters and iconic weapons and locations. Not everyone will experience this, but after a few hours, the iconic gun sound effect can feel grating enough to give you headaches. So ugly, it looks like an Xbox 360 launch title. The combat is a drag thanks to zombie punching and zombie group-hug-grapples. The game makes you sweat, which is kind of gross. The level design often makes it so that the player is cornered and dies, and objectives are often placed in stupid places. It's important to note that I didn't walk into Aliens expecting it to be bad; I found this out along the way. I can't say the same for Survival Instinct: I'd already read Kirk's scathing takedown, so I expected the game to be unpleasant. I mention this because I can't help but wonder if the expectation that something won't be very good changes the way you look at it. Make no mistake: Survival Instinct isn't a competent game. It's buggy, it's ugly, and you shouldn't play it. And yet Survival Instinct sometimes seemed to go between "lousy" to "so bad it's kind of good." At first, I was in disbelief that that's how you kill what is otherwise a fearsome foe. I mean, they single-handedly destroyed civilization, right? But eventually, having to kill zombies that way just became hilarious. Really? That's how I deal with my problems? It felt like my hammer or knife could just as easily be a huge fish I slap zombies with until they go away. Slapstick, almost. Where Aliens has an early moment in which I feared the Xenomorphs and then devolved into a mindless shooter, Survival Instinct has this strange tension between giving me moronic enemies that weren't a threat, to completely overwhelming me with swarms of zombies whenever I completed an important objective. Sometimes, I'd get into a big zombie group hug where every zombie waited their turn for me to stab them in the head. That's not good design by any means. As silly as it might sound, I prefer to have to deal with the combat in Survival Instinct than to shut my brain off as I bulldoze my way through enemies in Aliens. Either encounters were silly, or they were full of tension (because Survival Instinct isn't balanced). Better than boredom. But neither are preferable to, you know, a good game. But I say this as someone that didn't experience very many enemies like the ones in this video, where we see a Xenomorph stuck in place, seemingly playing an invisible piano. I'd probably have found Aliens to be a better experience if I ever came across aliens like that. Is that strange to say? To think a game would have been better if it had been worse in certain ways, like giving me morons for enemies? Comparing these two games reminds me that there is indeed an art to being terrible; look no farther than the cult-classic film, The Room. Beyond this, Survival Instinct is the more interesting game. 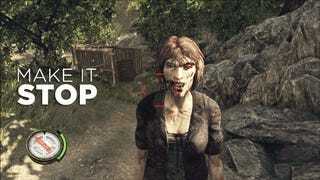 The way it works is, you travel travel from level to level, often looking for supplies and sneaking past zombies. Depending on the route you take, your vehicle will burn more fuel (but it might be safer) and you might risk having your car break down. You might also find other survivors to take with you, each with different traits and strengths. These management elements aren't fleshed out or well-implemented. Even so, they help (barely) elevate Survival Instinct into a more interesting experience than Aliens. At best, the most novel part of Aliens, design wise, is when it asks you to plop down a turret and defend a point. That's a shame, because the motion tracker could have been a fantastic mechanic, had it been used more. The best usage of the motion tracker came early in the game. You have to pull out the motion tracker and look for whatever caused the disturbance on your ship. While you might guess, as a player, that what is lurking in the shadows is an alien, you haven't actually seen one yet. The tension involved in getting closer and closer to the Alien was delicious, but it's never replicated. That, I think, is at the heart of why it's difficult for me to see Aliens as a better game than Survival Instinct. Many of us saw footage of Survival Instinct before the game dropped, and it wasn't very encouraging. Contrast that to seeing phenomenal, though completely misleading footage of Aliens. Plus, it's difficult to expect a first-person shooter to outdo the fantastic game by Telltale. While both games are based on existing properties, we were promised a faithful homage by Randy Pitchford, whereas the quick development time on Survival Instinct made it obvious that it was probably going to be no better than a cash-in. The expectations are completely different, even though both turned out to be awful games. I'm not saying you should play Survival Instinct, nor do I want to imply the game is good. Both Aliens and Survival Instinct are awful games for different reasons, one of the games just happens to be the slightly more interestingly shaped turd. I also recognize that the degree to which Aliens disappointed me is much higher than what I experienced with Survival Instinct, and that makes a hell of a difference when judging the games. Bird? Bee? Zombie-insect? Lord knows, but like I said, much of Survival Instinct felt hilarious—and I say this even though there would be instances where I'd like, be under a car, and a zombie would clip through the car and kill me. I'm not sure why I found that funny, but I did. Maybe it was the complete lack of expectations, maybe it was forcing myself to enjoy something so that I wouldn't be frustrated with wasting time on something awful. Maybe it was that Survival Instinct didn't give me a piercing headache every time I played it. Whatever it is, if I absolutely had to choose between playing Survival Instinct and Aliens, I'd go with Survival Instinct—even though it's arguably the worse game.